Groups, on matrix, of barrel-shaped crystals with very pronounced curvatures of faces and edges that give the crystals an almost globular shape. They have a very intense orange color, are very bright and they came from the most well-known locality for this variety. 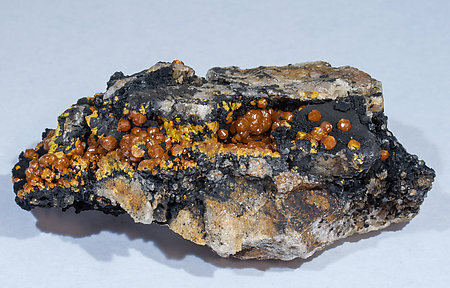 An excellent miniature of this classic Mimetite variety with well-defined and bright orange crystals on matrix. 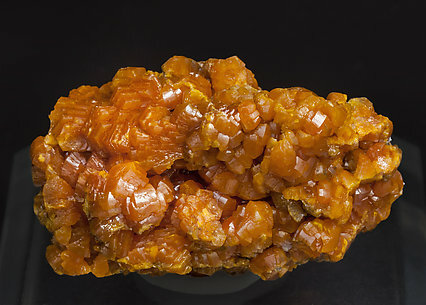 An excellent miniature of this classic variety of Mimetite. 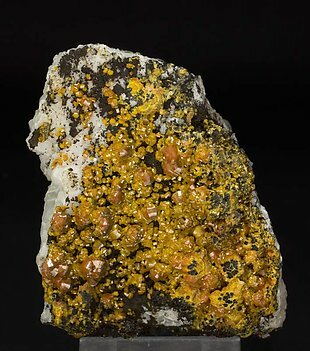 It has well defined curved crystals, bright orange color, on matrix. The sample is from the Thomas Moore collection whose label will be sent to the buyer. 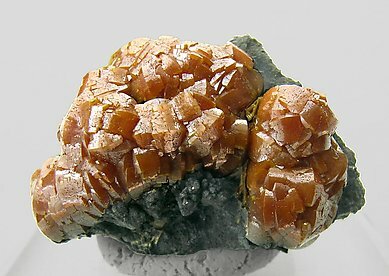 Typical barrel-shaped crystals, on matrix, with very pronounced curvatures of faces and edges that give the crystals an almost globular shape. The bigger crystals are orange and the smaller are yellow. The sample is with a curious and detailed label from Harrods (London), that we’ll send to the buyer. The number "SUT 79" means that it was a Ralph Sutcliffe specimen.